It’s cold outside but why go out when you can grab a cup of coffee or hot cocoa with the kids and enjoy a little down time in your own slice of paradise? These days it’s out with the formal (and stuffy) living room and in with the casual eat-in kitchen/family room. 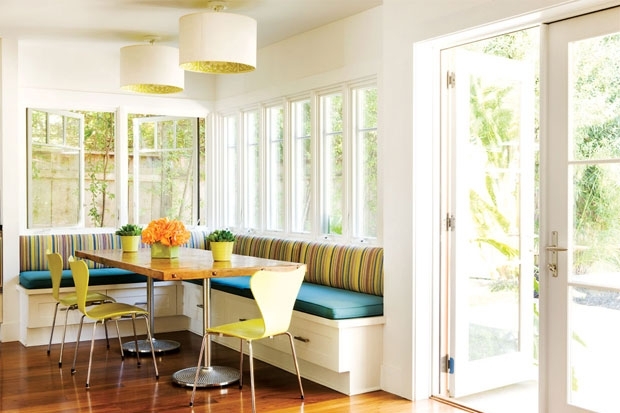 Make the area where the family congregates for breakfast, snacks and even homework a cozy and stylish nook by incorporating a banquette (built-in bench). 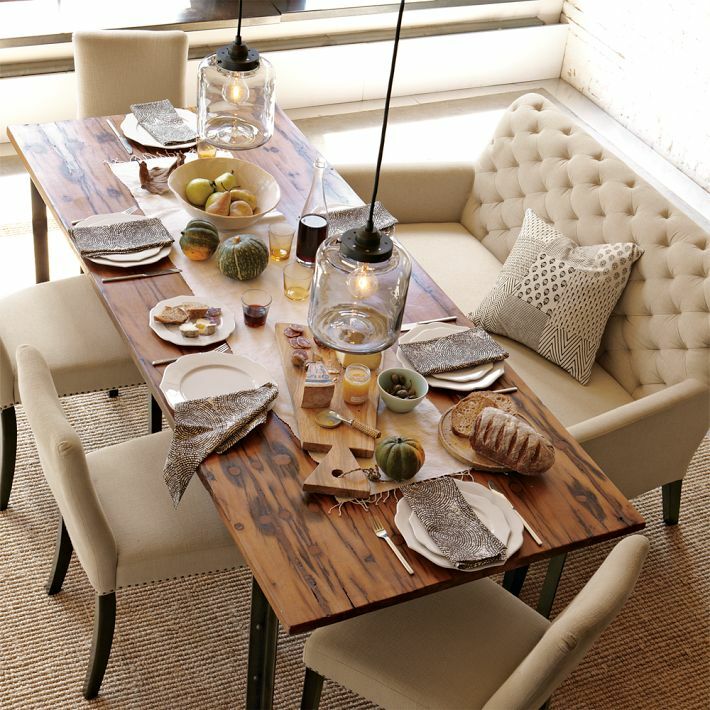 Have fun mixing and matching chairs with interesting upholstery to reflect your own personal chic style. Aerin Lauder uses a breezy blue geometric patterned fabric on her chairs and banquette and personalizes the space with art and personal photos. Photos courtesy of Elle Decor. This eclectic eat-in area pairs a pink table base with a rectangle wood top. The pillows blend interesting stripes and patterns. The vintage rattan lamp tops off the nook giving it a beach-inspired vibe. This cozy corner is brightened up with contrasting bright fabric in the form of pillows and upholstered chairs surrounding a vintage Saarinen Tulip Table. Pink and a faux zebra stripe work well in this French-feeling breakfast nook. This built-in bench with a soft velvet upholstered cushion and pillows is a great place to curl up with a book. These rattan chairs and pendant lamp from Ikea create a coastal oasis in this kitchen. 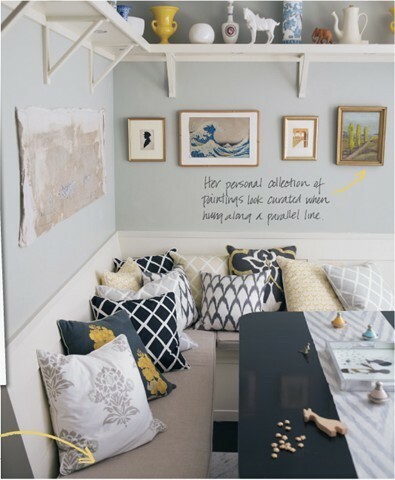 Serena and Lily’s yellow, gray and black patterned pillows on this banquette give it a modern look without being too stark. 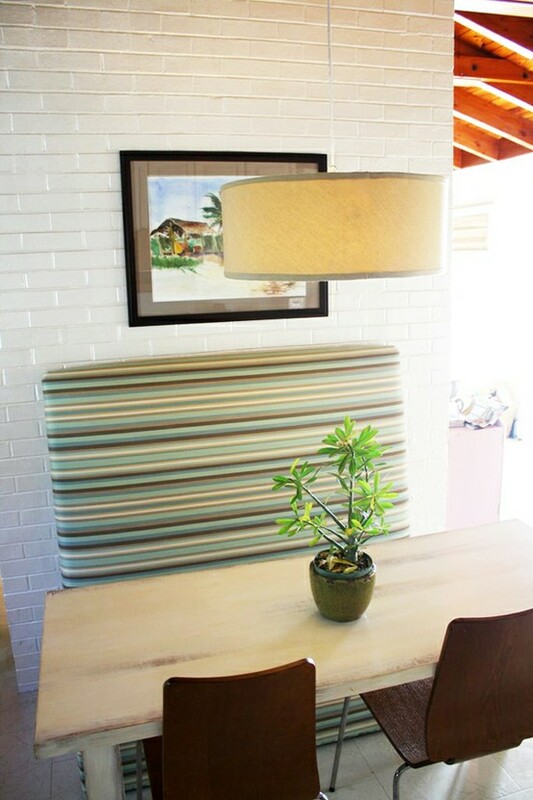 This large banquette is totally surfer chic. Photo courtesy of Coastal Living. Fun stripes are always sunny and fashionable and vinyl means easy clean up if young kids are eating here. 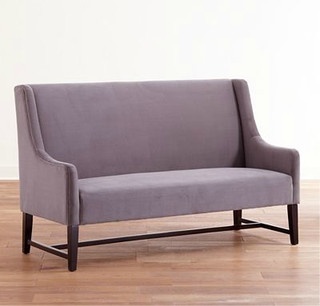 West Elm also has the Elton upholstered bench with tufting for a more sophisticated look. 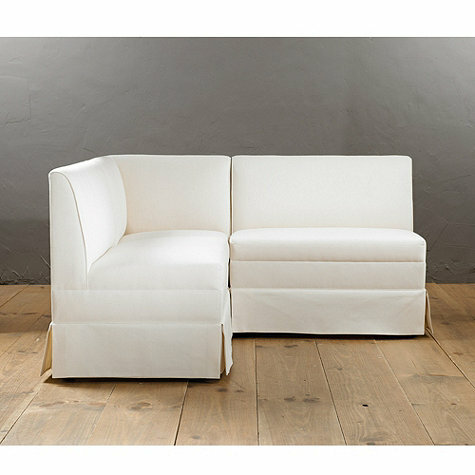 And World Market now offers the Hayden dining banquette bench at a bargain price. Better hurry before the relatives get here.